PROBLEM FOUR: Here’s a hint: You can calculate how any sheets wide and how many tall the kite is. 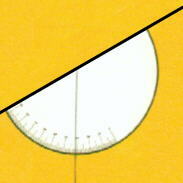 PROBLEM FIVE: When you are on level ground, the angle from the ground straight up to the kite is 90 degrees. If you measure the distance from that spot under the kite, back to where the flying line is anchored, then you can calculate the kite’s altitude. All you need to do is measure the angle from the anchor point up to the kite. You can do this with a protractor. Just attach a thin string with a weight at the end to the center of the protractor. Look along the flat edge up toward the kite and see what measurement the string reports. PROBLEM SIX: If you place two markers 100 feet apart and record the time it takes to fly from one to the other, you can calculate speed in feet per second or miles per hour.